Mix honey and warm water until dissolved then add the yeast. Let yeast mixture set for five minutes or until frothy and active. In a mixing bowl combine the flour and salt. Lightly dust a smooth surface with flour to kneed the dough. Once the yeast mixture is active stir in the yogurt and oil. Using an oiled wooden spoon to stir, slowly add the wet ingredients to the dry ingredient. Feel the dough, if it is too dry add some more luke warm water, if it is too wet at more flour. The dough should feel soft and not overly sticky to the touch. Stir until the mixture forms a ball then turn it out onto the dusted surface. Knead the dough for five minutes or until it becomes elastic. Place dough ball in a oiled bowl, covered with a clean towel or oiled plastic wrap (to prevent sticking) in a warm, draft free area for 1 to 2 hours until the dough has doubled, and the yeast has had time to ferment. After the dough has properly risen, preheat the broiler (if your oven requires a temperature, go for 550 degrees). Separate the dough into 6-8 round balls. Cover the balls with aluminum foil so they don’t dry out throughout the rest of the process. Add the extra flour to a mixing bowl. Take one of the dough balls and press it into the flour, flip it and do the same thing with the other side of the ball. Roll the ball out on a flat surface with a rolling pin or anything else you can find- a drinking glass would work. 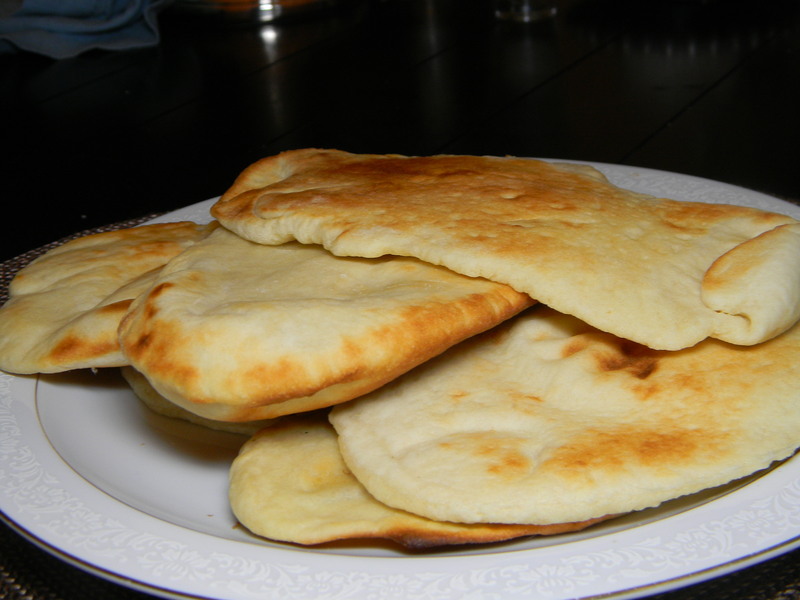 Place the naan on a baking sheet and lightly brush with water (again so it doesn’t dry out). Repeat this process with two more dough balls – about three will fit on a baking sheet. Place the baking sheet on a rack about 4 inches away from the broiler. Cook the naan for about two minutes, or until burnt bubbles appear. Turn the naan over with tongs and allow to cook for another thirty seconds to a minute. Repeat with the rest of the dough and ENJOY! Thanks to this site for the basis of this recipe.